Output 75.4.1 displays the table of level information for all classification variables in the CLASS statement. Output 75.4.2 displays the table of parameter information for the effects in the MODEL statement. Output 75.4.3 displays background information about the model fit. Included are the name of the input data set, the response variables used, the numbers of observations, events, and trials, the type of distribution, and the final value of the log-likelihood function. Output 75.4.5 displays the Type III test results for all effects specified in the MODEL statement, which include the degrees of freedom for the effect, the Wald Chi-Square test statistic, and the p-value. Output 75.4.6 displays the table of parameter estimates for the model. The PROBIT procedure displays information for all the parameters of an effect. Degenerate parameters are indicated by 0 degree of freedom. 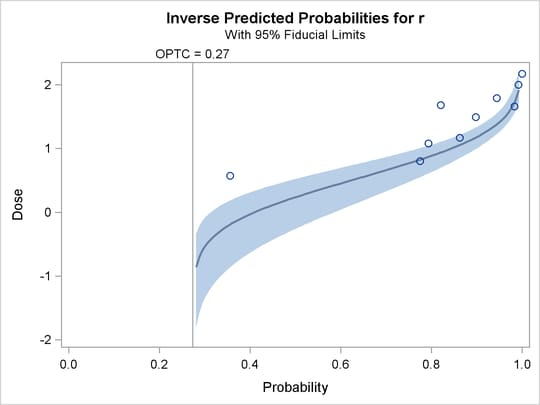 Confidence intervals are computed for all parameters with nonzero degrees of freedom, including the natural threshold C if the OPTC option is specified in the PROC PROBIT statement. The confidence level can be specified by the ALPHA= option in the MODEL statement. The default confidence level is 95%. Output 75.4.7 and Output 75.4.8 display tables of estimated covariance matrix and estimated correlation matrix for estimated parameters with a nonzero degree of freedom, respectively. They are computed by the inverse of the Hessian matrix of the estimated parameters. 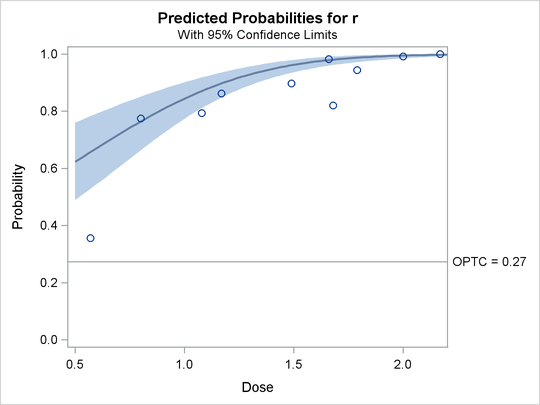 Output 75.4.9 displays the computed values and fiducial limits for the first single continuous variable dose in the MODEL statement, given the probability levels, without the effect of the natural threshold, and when the option INSERSECL in the MODEL statement is specified. If there is no single continuous variable in the MODEL specification but the INVERSECL option is specified, an error is reported. Output 75.4.10 displays the OUTEST= data set. All parameters for an effect are included. The name of a parameter is generated by combining the variable names and levels in the effect. The maximum length of a parameter name is 32. The plots in the following three outputs, Output 75.4.11, Output 75.4.12, and Output 75.4.13, are generated by the PLOTS= option. 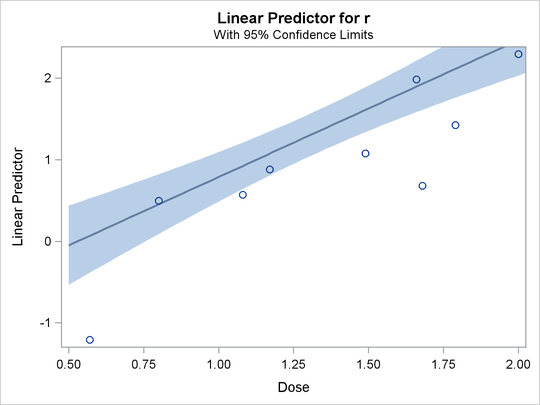 The first plot, specified with the PREDPPLOT option, is the plot of the predicted probability against the first single continuous variable dose in the MODEL statement. You can specify values of other independent variables in the MODEL statement by using an XDATA= data set or by using the default values. After the first invocation of PROC PROBIT, you have the estimated parameters and their covariance matrix in the data set OUTEST = Out1, and the fitted probabilities for the training data set epidemic in the data set OUTPUT = Out2. See Output 75.4.10 for the data set Out1 and Output 75.4.14 for the data set Out2. The validation data are collected in data set validate. The second invocation of PROC PROBIT simply passes the estimated parameters from the training data set epidemic to the validation data set validate for prediction. The predicted probabilities are stored in the data set OUTPUT = Out3 (see Output 75.4.15). The third invocation of PROC PROBIT passes the estimated parameters as initial values for a new fit of the validation data set with the same model. Predicted probabilities are stored in the data set OUTPUT = Out4 (see Output 75.4.16). Goodness-of-fit tests are computed based on the cells grouped by the AGGREGATE= group variable. Results are shown in Output 75.4.17.